The expression of pro-angiogenic cytokines, such as vascular endothelial growth factor (VEGF) and interleukin-8/CXCL8 (IL-8), plays an important role in tumor growth and metastasis. Low oxygen tension within poorly-vascularized tumors is thought to be the prime stimulus causing the secretion of VEGF. The expression of IL-8 by solid tumors is thought to be primarily due to intrinsic influences, such as constitutive activation of nuclear factor kappa B (NF-κB). However, VEGF expression is responsive to glucose deprivation, suggesting that low concentrations of nutrients other than oxygen may play a role in triggering the pro-angiogenic phenotype. Glucose deprivation causes endoplasmic reticulum (ER) stress and alters gene expression through the unfolded protein response (UPR) signaling pathway. A branch of the UPR, known as the ER overload response (EOR), can cause NF-κB activation. Thus, we hypothesized that treatments that cause ER stress and deprivation of other nutrients, such as amino acids, would trigger the expression of angiogenic cytokines by breast cancer cell lines. We found that glutamine deprivation and treatment with a chemical inducer of ER stress (tunicamycin) caused a marked induction of the secretion of both VEGF and IL-8 protein by a human breast adenocarcinoma cell line (TSE cells). Glutamine deprivation, glucose deprivation and several chemical inducers of ER stress increased VEGF and IL-8 mRNA expression in TSE and other breast cancer cell lines cultured under both normoxic and hypoxic conditions, though hypoxia generally diminished the effects of glucose deprivation. Of all amino acids tested, ambient glutamine availability had the largest effect on VEGF and IL-8 mRNA expression. The induction of VEGF mRNA expression, but not IL-8, was sustained and closely corresponded with the upregulated expression of the ER stress-responsive genes glucose-regulated protein 78 (GRP78) and growth arrest and DNA damage inducible gene 153 (GADD153). These results suggest that nutrient deprivation within the solid tumor microenvironment might contribute to the activation of a pro-angiogenic phenotype. The angiogenic switch may act to increase blood supply in response to nutrient deprivation as well as hypoxia. It has become apparent that some aspects of malignant progression are mediated through the effects of the tumor microenvironment. Environmental conditions affect the regulation of gene expression by both cancer cells and stromal cells within the tumor. As tumors grow in size, they must respond and adapt to a nutrient-limited environment. Neoplastic progression includes genetic alterations that allow malignant cells to ignore normal growth controls. For these cells, growth is limited by the delivery rate of oxygen and nutrients (such as glucose and amino acids) and removal rate of waste products (such as CO2 and lactic acid) . As a tumor grows in size, the cancer cells and the stromal cells that surround them both experience progressive hypoxia, nutrient starvation and acidosis until the tumor microenvironment becomes deleterious to growth or even toxic . These cells survive and adapt to this ischemic environment by producing pro-angiogenic factors to initiate the formation and attraction of new blood vessels to the tumor . In fact, an increase in the synthesis of pro-angiogenic factors is a natural cellular response to an ischemic environment . Many cancer researchers seem to associate ischemia only with a lack of oxygen delivery. For this reason, much attention has been devoted to understanding the way that tumor cells respond and adapt to oxygen limitation. Tumor hypoxia is a very active research area. We now know that many genes important to both tumor cell energy metabolism and angiogenesis are responsive to hypoxia . By far the most studied hypoxia-responsive gene is vascular endothelial growth factor A, the original member of the vascular permeability factor (VPF)/VEGF family of proteins. Vascular endothelial growth factor A (hereafter referred to as VEGF) is recognized as the single most important angiogenic factor . VEGF is a multifunctional cytokine that is widely expressed by tumor cells and increases microvascular permeability, induces endothelial cell migration and division, and promotes endothelial cell survival . It may also act as an autocrine survival factor for some cancer cells [7, 8]. Plasma levels of VEGF have prognostic value for several cancers, including breast cancer [9, 10]. In a tumor which has outgrown the existing vasculature, ischemia results in hypoxia that induces the transcription of VEGF through a well-defined signaling mechanism . This response to hypoxia stimulates angiogenesis to augment the existing vasculature and enable the delivery of greater amounts of oxygen, effectively alleviating the hypoxic stress. However, the hypoxic response mechanism does not always completely explain the increased VEGF expression by ischemic tissues. There are several studies suggesting that hypoxia is not the cause of heightened VEGF expression by ischemic tissues or tumors [11–16]. Several previous studies demonstrated that glucose deprivation also induces the expression of VEGF in cultured cell lines, including HepG2  and Hep3B  human hepatomas, U-937 human monocytic cell line , C6 rat glial tumor cell line , and ARPE-19 human retinal pigmented epithelial cell line . However, none of these studies demonstrated a mechanism for this effect. Glucose deprivation and treatments that cause ER dysfunction lead to the stressful accumulation of malfolded proteins within the ER, resulting in an endoplasmic reticulum stress response (ERSR) and activation of a signal transduction pathway known as the unfolded protein response (UPR). The transcription of several ER stress-responsive genes is highly induced by activation of the UPR, including glucose-regulated protein 78 (GRP78) which encodes the immunoglobin binding protein (BiP), and the growth arrest and DNA damage inducible gene 153 (GADD153) which encodes the CEBP-homologous protein (CHOP10). Because there are several studies demonstrating the activation of ERSR pathways and the expression of ER stress-responsive genes in tumor tissue [21–26], we reasoned that similar mechanisms could operate in cancer cells and, if so, then this could contribute to the expression of VEGF by poorly vascularized tumors. In addition, we sought to determine if expression of the CXC cytokine interleukin-8/CXCL8 (IL-8) was also responsive to nutrient deprivation and ER stress. IL-8 was first characterized as a neutrophil chemoattractant . Soon after its discovery it was identified as a pro-angiogenic factor, but its role in cancer has only recently been fully appreciated . Aberrant IL-8 expression has been documented in several solid tumor types, including breast . IL-8 seems to function as both a pro-angiogenic and a pro-metastatic factor [29–35]. Like VEGF, high serum levels of IL-8 have been shown to be a negative prognostic indicator in several cancers [36–39]. IL-8 expression is highly dependent upon activity of nuclear factor kappa B (NF-κB) [40–42]. In turn, NF-κB can be activated by ER stress, through a UPR signaling pathway that has been described as the ER overload response (EOR) . However, to the best of our knowledge, the effect of nutrient deprivation and ER stress on IL-8 expression has not yet been described. In the present study, a human breast carcinoma cell line (TSE cells) was used as the model system to test the hypothesis that VEGF and IL-8 expression by tumor cells is induced by nutrient deprivation and ER stress. The expression of VEGF and IL-8 was compared to that of ER and nutrient stress-responsive genes GRP78 and GADD153, as well as the hypoxia-responsive gene glyceraldehyde-3-phosphate dehydrogenase (GAPDH). The results show that VEGF expression by TSE cells, as well as other breast carcinoma cell lines, is highly responsive to nutrient deprivation and treatments that cause ER stress. In addition, we present the novel observation that the expression of IL-8 is responsive to nutrient deprivation and ER stress. These findings suggest that a low concentration of nutrients other than oxygen in the tumor microenvironment, or any stress that disrupts ER function, has the potential to increase tumor angiogenesis and metastasis. To determine if VEGF and IL-8 proteins were secreted by TSE cells under stress, as induced by glutamine deprivation, tunicamycin (an inhibitor of protein glycosylation in the ER), or hypoxia (mimicked by CoCl2 ), triplicate confluent cultures of the various cell types were grown in 6-well plates and incubated with 3 mL per well of complete media containing 4 mM glutamine as a control, 0.25 mM glutamine, 5 μg/mL tunicamycin, or 100 μM CoCl2 for 24 hours. ELISA was used to determine accumulated VEGF and IL-8 protein contents in the media (Figure 1). At 4 mM glutamine (the control condition), TSE cells showed a basal secretion of 5200 pg/mL VEGF protein. VEGF secretion increased to 6310 pg/mL with low glutamine conditions, to 10020 pg/mL with tunicamycin treatment and to 8340 pg/mL with CoCl2 treatment. Secreted IL-8 protein concentrations were 610 pg/mL with control conditions, 1310 pg/mL with low glutamine, 2640 pg/mL with tunicamycin treatment, and 560 pg/mL with CoCl2 treatment. Thus, TSE cells demonstrated an increased expression and secretion of both VEGF and IL-8 protein during conditions of glutamine deprivation and ER stress. Secretion of VEGF and IL-8 protein by TSE cells treated with low glutamine-containing media, tunicamycin, and cobalt chloride. Triplicate cultures of confluent TSE cells in six-well plates were incubated with 3 mL per well of complete medium containing 4 mM glutamine (Q), 0.25 mM glutamine, 5 μg/mL tunicamycin (Tunic) or 100 μM CoCl2 for 24 hours. A commercial ELISA was used to determine the amount of VEGF and IL-8 protein in the media. Data represent the mean concentration ± SD. To test the hypothesis that VEGF is an ER stress-responsive gene with characteristics of expression similar to other ER stress-responsive genes, and that the mechanism of VEGF mRNA upregulation through ER stress is distinct from the well characterized hypoxia response of VEGF, TSE cells were simultaneously subjected to ER stress or nutrient deprivation under normoxic and hypoxic conditions. TSE cells were grown to confluence, rinsed twice with PBS and fed with either complete control medium, glutamine-free medium, glucose-free medium, medium containing 5 μg/mL tunicamycin, medium containing 10 μM A23187 (a calcium ionophore which releases ER calcium stores), medium containing 10 μg/mL Brefeldin A (an inhibitor of ER-to-Golgi vesicle transport) or medium containing 0.1% (v/v) DMSO as a vehicle control. Cells under the above conditions were treated in duplicate and cultured either under normoxic (20% O2) or hypoxic (2% O2) conditions for 24h. Total RNA was isolated and Northern blotting analyses was performed (Figure 2A). Results were compared to the untreated normoxic control. VEGF, IL-8, GRP78, GADD153 and GAPDH mRNA expression by TSE cells following glutamine deprivation, glucose deprivation and treatment with chemical inducers of ER stress under normoxic or hypoxic conditions. (A) Confluent TSE cells were fed with complete control medium, glutamine-free medium (-Q), glucose-free medium (-Gluc), medium containing 5 μg/mL tunicamycin (Tunic), medium containing 10 μM A23187, medium containing 10 μg/mL Brefeldin A (Bref. A), or medium containing 0.1% (v/v) DMSO as a vehicle control and cultured under either normoxic (20% O2) or hypoxic (2% O2) conditions. Total RNA was isolated and Northern blotting analysis performed. (B) Confluent TSE cells were cultured in media containing the indicated concentrations of glucose while under normoxic (20% O2) or hypoxic (2% O2) conditions for 24 hours. Total RNA was isolated and Northern blotting analysis performed. This analysis showed that under normoxic conditions nutrient deprivation and chemical inducers of ER stress increase VEGF, GRP78 and GADD153 mRNA levels in similar fashions. VEGF mRNA expression was increased to the greatest extent (6-fold) in response to glutamine deprivation. VEGF mRNA expression was induced 4-fold in response to glucose deprivation, 3-fold in response to tunicamycin treatment, 5-fold in response to A23187 and 4-fold in response to Brefeldin A. GRP78 and GADD153 mRNA expression increased the most following Brefeldin A treatment (11-fold and 14-fold, respectively). After 24 h of treatment, IL-8 mRNA expression was increased only in response to glutamine deprivation, glucose deprivation and treatment with A23187 (2-fold, 3-fold and 22-fold, respectively). Under hypoxic conditions, VEGF mRNA was increased 4-fold in the complete media control sample compared to the VEGF mRNA level in the normoxic control sample, confirming VEGF's well-characterized response to hypoxia. Under hypoxic conditions, glutamine deprivation, tunicamycin, A23187, and Brefeldin A all caused further inductions of VEGF mRNA levels compared to the hypoxic control. Glutamine deprivation under hypoxic conditions raised VEGF mRNA levels 12-fold, twice the induction observed when TSE cells were glutamine starved under normoxic conditions. GAPDH mRNA was raised slightly under all hypoxic conditions. Of notice was the fact that glucose deprivation under normoxic conditions induced VEGF and GRP78 mRNAs 4-fold and 8-fold, respectively, but glucose deprivation under hypoxic conditions failed to induce expression of VEGF mRNA at all, and the induction of GRP78 mRNA fell to 3-fold. To confirm the observation that hypoxia impairs the induction of VEGF and GRP78 mRNA normally seen as a result of glucose deprivation, TSE cells were grown to confluence rinsed twice with PBS and fed with DMEM containing various concentrations of glucose: 0.0, 0.125, 0.25, 0.5, 1, 2, 4, 16 or 25 mM. Dialyzed FBS was used to supplement the media to prevent serum-derived glucose from being added. Duplicate samples were then cultured in hypoxic (2% O2) or normoxic (20% O2) conditions for 24 hours. Total RNA was isolated and Northern blotting analysis for VEGF, GRP78, GADD153, IL-8 and GAPDH mRNA was performed (Figure 2B). Samples were compared with the normoxic control (25 mM glucose). Under normoxic conditions, VEGF and GRP78 mRNAs were maximally induced at 2 mM glucose to 7-fold and 13-fold, respectively. In contrast, under hypoxic conditions inductions of VEGF and GRP78 mRNAs were almost completely suppressed. Hypoxia suppressed GADD153 mRNA inductions in response to glucose deprivation as well, by about a multiple of 2 at all concentrations below 2 mM glucose. Under normoxic conditions, GADD153 mRNA was maximally induced 17-fold at 1 mM glucose. However, at the same concentration of glucose under hypoxic conditions GADD153 mRNA was induced only 8-fold. Under normoxic conditions, IL-8 mRNA was greatly induced in a dose-dependent manner in response to glucose deprivation, being maximally induced 43-fold at 0.125 mM glucose and similarly induced as glucose concentrations were reduced to zero. Thus, this dose-response experiment confirmed that IL-8 mRNA expression was induced by glucose deprivation. However, inexplicably, a much greater level of induction of IL-8 expression by glucose deprivation was obtained in this experiment than in the previous experiment (Figure 2A). The induction of IL-8 was greatly reduced under hypoxic conditions. For example, at 0.125 mM glucose IL-8 mRNA was only induced by about 4-fold in the presence of hypoxia. Thus, the effect of glucose deprivation upon the expression of VEGF, IL-8 and other ER stress-responsive genes was retained but markedly reduced under hypoxic conditions. Expression of VEGF and ER stress-responsive genes was also examined and compared in TSE, MDA-MB-231, MDA-MB-453, T47D, and MCF-7 human breast cancer cell lines subjected to nutrient deprivation and ER stress for 8 h under normoxic and hypoxic conditions. 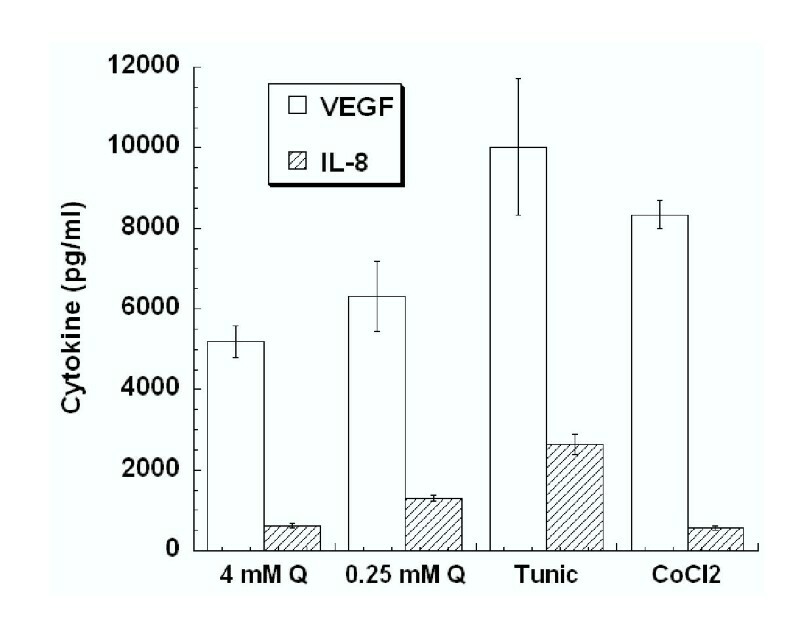 Confluent cells were fed with complete control medium, glutamine-free medium, glucose-free medium, medium containing 5 μg/mL tunicamycin, 500 nM thapsigargin, 10 μM A23187, 1 mM DTT, 10 μg/mL Brefeldin A, or medium containing 0.1% (v/v) DMSO as a vehicle control. The cultures were then placed in 20% O2 or 2% O2-containing environments for 8 hours. Total RNA was isolated and Northern blot analysis performed (Supplemental Figure 1 [see Additional File 1]). In response to glutamine deprivation, VEGF mRNA expression was similarly increased in all cell lines, with the greatest increase in MDA-MB-231 (2.3-fold). Glucose deprivation increased VEGF mRNA expression in every cell line tested with the greatest induction seen in T47D cells (2.9-fold). Tunicamycin, thapsigargin, Brefeldin A and A23187 increased VEGF mRNA expression in all cell lines tested. The MDA-MB-231 cell line increased the expression of VEGF mRNA to the greatest extent following treatment with the chemical inducers of ER stress, tunicamycin (2.5-fold), thapsigargin (2.5-fold), A23187 (5.0-fold) and Brefeldin A (3.2-fold). Under normoxic conditions, treatment with DTT induced the expression of VEGF mRNA appreciably only in the MDA-MB-231 cell line (1.9-fold). Hypoxia alone increased VEGF mRNA expression in all cell lines tested, with MDA-MB-453 cell line demonstrating the greatest induction (3.3-fold). Upon glutamine deprivation under hypoxic conditions, TSE (3.3-fold), T47D (3.6-fold) and MCF-7 (2.9-fold) cell lines showed additionally increased VEGF mRNA expression compared to the hypoxic control. Under hypoxic conditions, 8 h of glucose deprivation also additionally upregulated VEGF mRNA expression compared to the hypoxic control lanes in TSE (2.9-fold) and MDA-MB-231 (8.8-fold). Glucose deprivation under hypoxic conditions repressed the expression of VEGF mRNA compared to the hypoxic control lanes in the MCF-7, T47D and MDA-MB-453 cancer cell lines. Most treatments with chemical inducers of ER stress during hypoxic culture conditions resulted in VEGF mRNA levels that were higher than those produced by hypoxia alone in the MCF-7, MDA-MB-231 and MDA-MB-453 cell line. In T47D cells, only A23187 treatment resulted in greater (4.0-fold) VEGF mRNA levels than hypoxia alone. Expression of IL-8 mRNA was detected only in TSE and MDA-MB-231 cells, and was markedly increased under both normoxia and hypoxia by treatment with glutamine-free medium, glucose-free medium, thapsigargin, A23187 and Brefeldin A. The magnitude of inductions was not quantifiable because IL-8 mRNA was essentially undetected in control samples. However, A23187 induced the greatest IL-8 responses, tunicamycin caused relatively slight inductions and DTT did not appreciably induce IL-8 expression in either TSE or MDA-MB-231 cells. Surprisingly, hypoxia did not appreciably induce IL-8 mRNA expression in any of these breast cell lines. Both tunicamycin and DTT caused dramatic inductions of GRP78 mRNA expression in each cell. GADD153 expression by these cells was appreciably responsive to tunicamycin, but not to DTT treatment. To determine if VEGF mRNA expression is responsive to the deprivation of amino acids other than glutamine, TSE cells were incubated in media lacking one or all of the amino acids found in modified Eagle's medium (MEM). TSE cells adapted to MEM were grown to confluence, rinsed twice and re-fed complete MEM, MEM lacking all amino acids, or MEM deficient in one of each of the 13 amino acids present in complete MEM and incubated for 12 hours. Dialyzed FBS was used to negate the contribution of amino acids within the sera. Total RNA was isolated and Northern blotting analyses were performed (Figure 3B). The amount of VEGF, GRP78, GADD153, IL-8 and GAPDH mRNA was determined relative to the amount of 18S rRNA within each sample and mRNA contents were compared to that of control cells in complete MEM and amino acid-free MEM (Figure 3A). VEGF mRNA expression was most responsive to glutamine deprivation (9-fold). Deprivation of other amino acids elicited smaller inductions. For example, lack of arginine induced VEGF mRNA 7.6-fold and lack of leucine, lysine and methionine each induced VEGF mRNA approximately 5-fold. Deprivation of all 13 amino acids induced VEGF mRNA 5.6-fold. GRP78 mRNA was induced to a lesser extent than VEGF by deprivation of various amino acids. Glutamine deprivation had the greatest effect on GRP78 mRNA inducing it 2.3-fold. GADD153 mRNA was also more responsive (3.9-fold) to glutamine deprivation than to a lack of other amino acids. Total amino acid starvation resulted in a marked 12.3-fold induction of GADD153. At this time point, IL-8 expression was only responsive to glutamine deprivation, with an induction of slightly more than 2-fold. However, IL-8 mRNA expression was greatly induced 12-fold by total amino acid starvation. Comparison of VEGF with GADD153 mRNA levels yielded a good correlation (r = 0.79). Comparison of VEGF with GRP78 mRNA levels yielded a decreased correlation (r = 0.63). Response of VEGF, IL-8, GRP78, GADD153 and GAPDH mRNA expression to deprivation of various amino acids. TSE cells adapted to MEM were grown to confluence, and cultured for 12 hours in MEM without any amino acids (-13 a.a.), containing the normal supplement of amino acids (+13 a.a.), or in media in which one amino acid at a time was deleted as indicated. Total RNA was isolated and Northern blotting analysis was performed. Fold increases in mRNA levels relative to the sample containing the normal supplement of amino acids (+13 a.a.) are shown in (A). The effects of glutamine deprivation were further characterized by monitoring the expression of VEGF, IL-8 and ER stress response genes following various durations of complete glutamine starvation and culture conditions with a range of initial media glutamine concentrations. To examine the kinetics of inductions for VEGF, GRP78, GADD153 and IL-8 mRNA expressions, TSE cells were grown to confluence, rinsed twice and fed with glutamine-free DMEM supplemented with dFBS. At various times (0, 3, 6, 12, 24, 48 and 72h) total RNA was isolated and Northern blot analyses for VEGF, GRP78, GADD153, IL-8, GAPDH and 18S rRNA were performed (Figure 4A). The amounts of these mRNAs were determined relative to the amount of 18S rRNA in each sample and compared with the 0 hour time point control. VEGF mRNA levels increased rapidly to 3-fold the initial level by 3 hours and continued to increase, reaching 7-fold at 72 hours of glutamine deprivation. GRP78 mRNA expression was induced 1.5-fold at three hours and, 2.5-fold at 6 hours and maintained about a 2-fold induction for the rest of the time course. GADD153 mRNA expression was induced 3.2-fold at 3 hours and maintained roughly the same level of expression until the 72 hour time point. IL-8 mRNA expression was promptly induced, reaching 4.7-fold by 3 hours and a maximal induction of 15-fold at 6 hours. Following a maximal induction at 6 hours, IL-8 mRNA levels decreased to about 4-fold at 24 hours and maintained this level of expression until the 72 hour time point. GAPDH levels actually decreased slightly during glutamine deprivation. Response of VEGF, IL-8, GRP78, GADD153, and GAPDH mRNA expression to glutamine starvation over time, and to various initial concentrations of glutamine in the media. (A) Confluent TSE cells were cultured in glutamine-free medium for the times indicated, or (B) in media containing the indicated initial concentrations of glutamine for 24 hours. Total RNA was isolated, and Northern blotting analysis was performed. To determine the sensitivity of VEGF and IL-8 expression to ambient glutamine levels and to compare their expression with the expression of GRP78, GADD153, GAPDH mRNA, TSE cells were grown to confluence, rinsed twice and fed with DMEM containing 0.0, 0.06, 0.125, 0.25, 0.5, 1, 2, or 4 mM glutamine and supplemented with dFBS. The cells were then cultured for 24 hours, total RNA was isolated and Northern blotting analysis was performed (Figure 4B). The amount of VEGF, GRP78, GADD153, IL-8 and GAPDH mRNAs were determined relative to the amount of 18S rRNA in each sample, and these values compared with mRNA contents of the 4 mM glutamine sample. VEGF mRNA expression increased measurably as initial media glutamine concentrations were reduced below 2 mM. At the relatively low glutamine concentration of 250 μM, VEGF mRNA expression was induced 4.7-fold, and was maintained at a 5-fold level until glutamine was totally absent. Thus, VEGF expression was very responsive to a range of glutamine concentrations that compare favorably with the human physiological plasma concentration of 0.6 mM. The dose-response of inductions for IL-8, GRP78, and GADD153 mRNAs all closely resembled that of VEGF mRNA. Comparison of VEGF and IL-8 mRNA levels gave a correlation coefficient of r = 0.95. Comparison of VEGF with GADD153 mRNA levels yielded a correlation coefficient of r = 0.99. Comparison of VEGF with GRP78 mRNA levels yielded a correlation coefficient of r = 0.90. Thus, VEGF and IL-8 mRNA expression was induced rapidly in response to glutamine starvation, was regulated within a physiologically Relevant range of glutamine concentrations, and correlated strongly with other ER stress-responsive genes. GAPDH mRNA levels did not correlate with those of VEGF. In 1992 Sweiki and co-workers published a landmark paper suggesting that expression of VEGF in response to hypoxia was responsible for neovascularization of glioblastoma multiform . Since then, numerous studies on the regulation of VEGF by hypoxia have been published. The relevance of this regulation was highlighted as it was eventually experimentally demonstrated that rapidly growing tumors are indeed generally hypoxic, with regions of very low oxygen tensions [1, 46–48]. Thus, there is now the strong perception that oxygen is the limiting environmental factor in tumor growth and the major factor in controlling tumor VEGF expression and angiogenesis. However, there are some inconsistencies in the tumor hypoxia-VEGF theory. For example, Kotch and co-workers studied the role of HIF-1 in embryonic growth and vascular development by creating a HIF-1α knockout mouse . Rather than expressing less VEGF as expected, HIF-1α-/- embryos expressed even more VEGF than the HIF-1α+/+ or HIF-1α+/- embryos at the same stage. The authors surmised that it was glucose deprivation that had caused up-regulation of VEGF and demonstrated that cultured cells increased VEGF expression in response to glucose deprivation. When Tsuzuki and colleagues used HIF-1α-/- embryonic stem (ES) cells to form tumors, they found that tumor VEGF expression was diminished. However these HIF-1α-/- tumors expressed nearly two-thirds the amount of VEGF that wild-type ES cell tumors expressed . They concluded that some of this VEGF expression was due to tumor-infiltrating stromal cells. However, these HIF-1α-/- tumors expressed significantly more VEGF than tumors formed from VEGF-/- ES cells. Likewise, when Maxwell and co-workers used HIF-1β-/- hepatoma cells to form tumors, they found that the expression of the hypoxia-responsive gene GLUT3 was abrogated, but the expression of VEGF was only reduced . In addition, when Griffiths and colleagues  compared the vessel density of HIF-1β-/- hepatomas to wild type hepatomas they observed "no differences in vascularity." These results were not due to alternative mechanisms of hypoxic induction of VEGF, for all these studies showed that basal VEGF expression was negligible in HIF-1α-/- or HIF-1β-/- cells and that VEGF expression was not induced when these knockouts were made hypoxic in vitro. Thus, from these studies we conclude that although hypoxia plays an important role in induction of tumor VEGF expression, other factors also contribute to the control of VEGF expression in vivo. Raliegh and co-workers tested the role of hypoxia in the induction of tumor VEGF expression when they compared the distributions of VEGF protein and the hypoxic marker pimonidazole in eighteen patients with invasive squamous cell carcinoma of the uterine cervix and head and neck . These authors stated that, "a quantitative immunohistochemical comparison of hypoxia and VEGF protein expression revealed no correlation between these two factors." Similarly, Fukumura and colleagues studied the distribution of a hypoxic marker and VEGF expression in tumors and found no spatial correlation . West and co-workers used a needle polarographic oxygen electrode to directly measure oxygen tensions in micro-regions of 38 human cervical cancers prior to tumor removal and then compare these measurements to regional VEGF and platelet-derived endothelial growth factor expression levels measured by immunohistochemistry of tumor sections . These authors stated that "There was no relationship between hypoxia and the expression of angiogenic factors (VEGF, PD-ECGF)." From these data, we conclude that it is unclear to what extent the mechanism of VEGF induction by hypoxia contributes to tumor angiogenesis. We propose that environmental factors other than hypoxia may also contribute to induction of VEGF expression in the tumor environment. Tumor cells can also be subjected to glucose and amino acid deprivation in the tumor microenvironment. We hypothesized that cancer cells would respond to these forms of nutrient deprivation by increasing the expression of pro-angiogenic factors, such as VEGF and IL-8. This response would allow tumor cells to overcome nutrient deprivation, as well as hypoxia, by increasing the vascular supply of nutrients or by metastasizing to a nutrient rich environment. Using a human breast carcinoma cell line we found that deprivation of glutamine and treatment with tunicamycin caused increased secretion of both VEGF and IL-8. This data suggests that VEGF and IL-8 mRNA continue to be translated and secreted even during a stress, like tunicamycin treatment, that causes ER stress and global translation inhibition. Deprivation of glucose, deprivation of each MEM amino acid except cystine, and specific chemical inducers of ER stress (tunicamycin, Brefeldin A, and A23187) markedly increased the expression of VEGF mRNA. 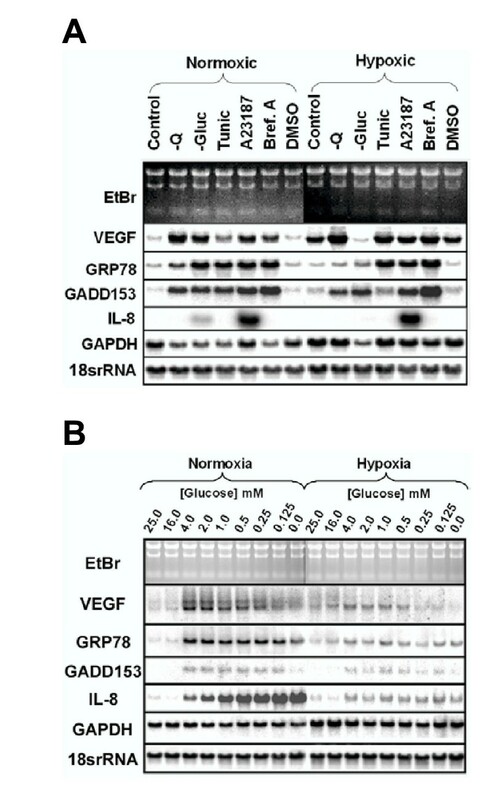 The inductions of VEGF mRNA expression in response to various durations of glutamine deprivation and various glutamine concentrations were well correlated with the inductions of mRNA expression of ER stress-responsive genes GRP78 and GADD153, suggesting that the induction of VEGF expression was also due to a transcriptional ERSR. These studies extend previous findings with other cell types showing that VEGF is responsive to glucose deprivation [11, 17–19]. To the best of our knowledge, this is only the second study published that demonstrates that VEGF expression is responsive to amino acid deprivation, the first being our previous study with retinal pigmented epithelial cells . In that study we presented evidence that, similar to hypoxia, glutamine deprivation increased steady-state VEGF mRNA levels through both transcriptional activation and mRNA stabilization. Treatment with tunicamycin caused greater increases in secreted VEGF and IL-8 protein accumulation during a 24 hour period than did treatment with 0.25 mM, glutamine-containing media. In contrast, the level of VEGF and IL-8 mRNAs at the end of 24 hour period were increased more by glutamine starvation (0 mM) than tunicamycin treatment. In response to tumicamycin, VEGF mRNA increased by 3-fold and secreted protein accumulation increased similarly, by approximately 2-fold. In response to glutamine starvation, IL-8 mRNA increased by 2-fold and secreted protein accumulation increased similarly, by slightly over 2-fold due to less severe glutamine deprivation (0.25 mM). Surprisingly, the accumulation of secreted IL-8 protein occurred with tunicamycin treatment (Figure 1), while the level of IL-8 mRNA in like-treated cells shown in Figure 2A is negligible. However, protein accumulation in the media is expected to be a function of the integrated temporal mRNA level over the 24-hour period. As demonstrated for glutamine deprivation, the temporal nature of the IL-8 response is transient (Figure 4A). Thus the mRNA level at 24 hours should not be expected to be consistent with the protein accumulation. We have not determined the temporal nature of the tunicamycin response. VEGF mRNA expression by T47D, MCF-7, MDA-MB-453 and MDA-MB-231 breast carcinoma cell lines was also increased in response to nutrient deprivation and chemical inducers of ER stress further suggesting that this is a general phenomenon that occurs in several, if not all, cell lines. Only TSE and MDA-MB-231 expressed IL-8 mRNA levels that were detectable by Northern blotting, and both cells exhibited induction of IL-8 by nutrient deprivation and ER stress. However, chemical inducers of ER stress had quite variable effects on IL-8 expression. It should be noted that hypoxia did not appreciably induce IL-8 expression in any of the breast cancer cell lines tested. This is surprising, given that IL-8 has been identified as being responsive to hypoxia in several tumor cells (for review see ). The hypoxic induction of IL-8 expression is certainly cell-specific, for, in a recent study of a series of transitional cell carcinoma cell lines, Karashima and co-workers found that some cell lines did and some cell lines did not exhibit hypoxic induction of IL-8 expression . It is not the case that 2% oxygen is not severe enough hypoxia to induce IL-8 expression in breast cancer cells, for we have tested total anoxia and not observed IL-8 induction (data not shown). To the best of our knowledge this is the first demonstration that IL-8 expression is responsive to nutrient deprivation and ER stress. In initial experiments, IL-8 mRNA expression seemed relatively unresponsive to treatments, with the exception of glucose deprivation, A23187 and complete amino acid deprivation. However, the response of IL-8 expression to glutamine deprivation was observed to be substantial at an earlier time than first examined. Because IL-8 transcription is very responsive to NF-κB, which can be stimulated by ER stress , it was perhaps predictable that IL-8 expression was induced by ER stress. In contrast, amino acid deprivation would not be expected to activate the UPR or EOR responses, but this also upregulated IL-8 expression. Just recently, Jiang and co-workers showed that amino acid deprivation activates NF-κB, and that this is dependent on phosphorylation of the eukaryotic initiation factor 2 alpha subunit (eIF2alpha) by GCN2 (EIF2AK4) . Thus, it is perhaps also not surprising that amino acid deprivation upregulated IL-8 expression. We have recently found that NF-κB and AP-1 activity is increased by glutamine deprivation of TSE cells and that these factors are necessary for induction of IL-8 expression in response to glutamine deprivation (E. Bobrovnikova-Marjon, unpublished observations). However, a macroarray experiment examining the expression 111 NF-κB-responsive genes found only 13 (including IL-8) that were induced by glutamine deprivation (E. Bobrovnikova-Marjon, unpublished observations). Thus, not all NF-κB-responsive genes are induced by glutamine deprivation. Glutamine deprivation and chemical inducers of ER stress in conjunction with hypoxia induced the expression of VEGF to a greater extent than hypoxia alone, suggesting that hypoxia and an ERSR pathway can increase the expression of VEGF through distinct mechanisms. In addition, unlike the expression of ER stress-responsive genes, the hypoxia-responsive gene GAPDH was not regulated similarly to VEGF or IL-8. Of interest was the observation that glucose deprivation and hypoxia independently increased the expression of VEGF mRNA, but together had much less effect. A similar phenomena was previously reported to occur in the C6 glial tumor cell line . It is possible that hypoxia combined with glucose deprivation drastically impedes the cell's production of ATP and inhibits the signal transduction processes or transcription factor expression needed for these responses. However, GADD153 mRNA induction was not severely impeded by the same combination of hypoxia and glucose deprivation. Of all the amino acids tested, glutamine deprivation increased the expression of VEGF and IL-8 by the greatest extent. Glutamine's function as a nitrogen transporter, fuel source, and its high concentration in the blood make it a prime candidate for the study of the effects of nutrient availability on the expression of VEGF. TSE cells are particularly dependent upon glutamine for growth and viability, compared to several other human breast carcinoma cell lines . However, it should be noted that confluent cultures of TSE cells, like those used in the current study, do not exhibit appreciable signs of cell death when glutamine starved for even extended periods (data not shown). We previously observed that tumor xenographs formed from TSE cells contained progressively less glutamine as tumor size increased, demonstrating that glutamine deprivation can occur in vivo . The main rationale for this study was to test the hypothesis that nutrient deprivation and/or ER stress increases cancer cell VEGF and IL-8 expression. This is complemented by previous studies suggesting that tumor cells do experience ER stress in vivo. Gazit and co-workers demonstrated that the GRP78 promoter was able to drive high expression levels of green fluorescent protein (GFP) in an experimental murine fibrosarcoma tumor model . This group went on to use the GRP78 promoter to drive the tumor-specific expression of HSV-tk as a scheme for cancer gene therapy . Recently this group produced a transgenic mouse containing the mouse GRP94 ER stress-responsive promoter fused to the LacZ reporter gene . This promoter, which contained three ER stress response DNA elements (ERSRE), was inactive in all normal tissues examined but was highly active in both spontaneously-formed and DMBA-induced tumors. Close examinations of these tumors revealed that LacZ expression was greatest in both tumor cells and macrophages at the border of necrotic areas. In addition, several other studies have demonstrated that genes activated in response to ERSR pathways are expressed in tumors. These include GRP78 [24, 56], GRP78, GRP94 and calnexin . Recently, there have been a great number of discoveries revealing the role of ERSR in normal development and pathological processes. We contend that the solid tumor environment, with its abnormal and insufficient vasculature, is a prime candidate for ERSR activation and we hypothesize that ERSR can trigger an angiogenic switch in an effort to improve nutritional delivery. Further experiments are needed to determine if ERSR signal transduction pathways and transcription factors are involved in the inductions of VEGF and IL-8 expression by nutrient deprivation and ER stress. Perhaps more importantly, it remains to be determined if these mechanisms are active and contributing to the expression of VEGF and IL-8 and thus the angiogenic and metastatic phenotype of tumor cells in vivo. TSE human breast carcinoma cells were provided by Dr. Simon Powell (Massachusetts General Hospital, Department of Radiation Oncology, Boston, MA). T47D, MCF-7, MDA-MB-453 and MDA-MB-231 breast carcinoma cell lines were obtained from the American Type Culture Collection (ATCC). Cells were maintained in Dulbecco's modified Eagle's medium (DMEM, high glucose formulation) supplemented with 4 mM L-glutamine, 10% v/v fetal bovine serum (FBS), 100 U/mL penicillin, 100 μg/mL streptomycin, and 0.25 μg/mL amphotericin B. For Northern blot analyses, cells were plated in 60 cm2 tissue culture dishes, grown to confluence, fed with fresh medium one day before being rinsed twice with Dulbecco's phosphate-buffered saline (DPBS), and re-fed with fresh media containing drugs or other treatments as described in the figure legends. For glutamine-deprivation experiments, glutamine-free medium (DMEM supplemented with 10% v/v dialyzed FBS (dFBS) and no glutamine) containing added glutamine or drugs was used as described in the figure legends. Experiments including glucose-starved conditions were performed with glucose-free DMEM-based medium supplemented with dFBS as described. Starvation for multiple amino acids was performed with TSE cells adapted to growth over several successive passages in modified Eagle's media (MEM) supplemented as described above for DMEM and dFBS was used during the experiments. Cells subjected to hypoxic stress were grown under normoxic culture conditions until treatment, rinsed twice with DPBS, then treated as described in the legends and placed under hypoxic conditions (37°C, 5% CO2, 2% O2, and 95% humidity). For the ELISA, cells were plated in 10 cm2 wells of 6-well plates, grown to confluence, fed with fresh medium one day before being rinsed twice with DPBS, and re-fed with fresh medium (3 mL per well), containing drugs or other treatments, as described in the figure legend. ELISA assays were performed with commercial VEGF and IL-8 ELISA kits (R&D Systems, Minneapolis, MN). Assays for each sample were performed in duplicate, and readings were compared with standard curves obtained with human recombinant VEGF165 provided. Total RNA was isolated by the one-step acid-phenol guanidinium procedure , with RNA extraction reagent (RNA-Stat60; TelTest, Friendswood, TX), according to the manufacturer's protocol, followed by an additional phenol-chloroform extractions. Northern blot analysis was performed as previously described  with cDNAs corresponding to human VEGF (dbEST189750), GRP78 (HAEAC89; ATCC), GADD153 (dbEST298470), IL-8 (dbEST6044688), glyceraldehyde 3-phosphate dehydrogenase (GAPDH, pHcGAP; ATCC) and rat 18S rRNA used as templates to generate 32P-labeled probes with a random-primer labeling kit (Amersham Pharmacia Biotech, Piscataway, NJ). The rat 18S rRNA cDNA template was RT-PCR generated from total rat kidney RNA using R18F2 sense (5'-GCTACCACATCCAAGGAAGGC-3') and R18B1 anti-sense (5'-CCCGTGTTGAGTCAAATTAAGCC-3') primers. Results of Northern blot analyses were quantified using a phosphorescence imager (STORM) and accompanying software (ImageQuant; Molecular Dynamics, Sunnyvale, CA). Integrated band intensities for the probed mRNAs were divided by those for 18S rRNA to obtain normalized values of mRNA levels in each sample. Fold increases were obtained by dividing normalized integrated band intensities for experimental samples by that of a control (untreated, time 0, or complete media) sample. ELISA assays were performed in duplicate, and readings were compared with standard curves obtained with human recombinant VEGF165 provided. Means and standard deviations of concentrations in triplicate samples were compared by Student's t-test. The authors wish to acknowledge Dr. Robert Glew, Professor of Biochemistry and Molecular Biology, UNM-SOM for his invaluable assistance in the writing of this manuscript. This work was supported by: Grant CA077272 from the National Cancer Institute (SFA), Grant BC023698 from the Department of Defense Breast Cancer Research Program (SFA), University of New Mexico School of Medicine Research Allocation Grant (SFA), and the University of New Mexico Department of Biochemistry and Molecular Biology Faculty Predoctoral Fellowship (PLM). PLM was supported by Grant GM6020 from the National Institute of General Medical Sciences' Minority Biomedical Research Support Program/Initiative for Minority Student Development Program. This work represents partial fulfillment of the requirements for Masters of Science Degree in Biomedical Sciences by PLM. PLM performed all experiments with the assistance of EVB-M and wrote the initial draft of the manuscript. EVB-M assisted with tissue culture, Northern blotting and with composition of figures and text. SFA planned and supervised the study and wrote the final draft of the manuscript.